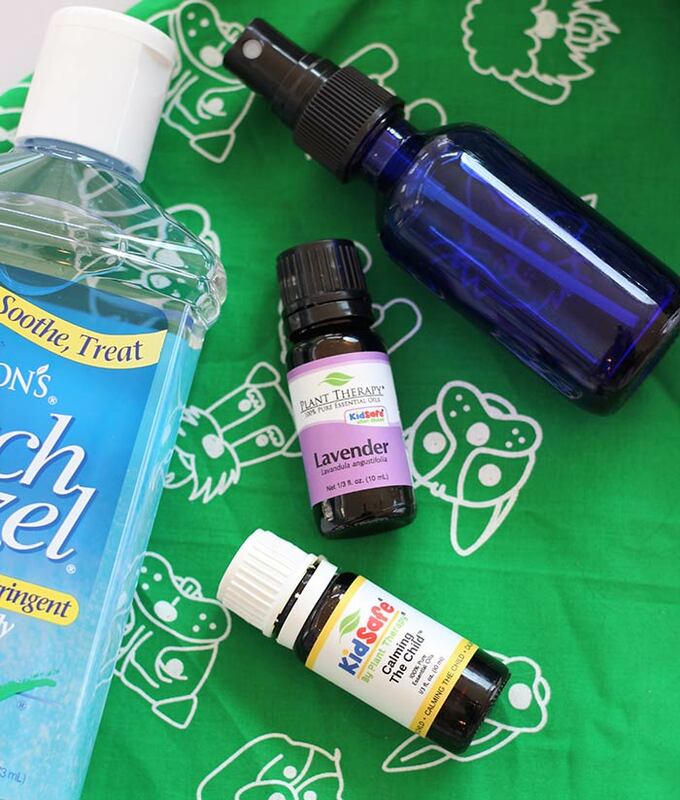 Make a natural dog calming spray to help your pet relax at home or on the go. Includes free printable labels! Not too long ago, I was getting gas when a UPS truck pulled up. The driver hopped out and was headed to the pump when he smiled and waved at me. "Hey!" he said. "I know you! Crazy white dog, right?" Yep. That's me. I do get a lot of packages, but what makes my house so memorable is my dog Griffey, who freaks out when the big brown truck pulls up. Or the mail, or FedEx, or when a neighbor walking a dog strolls by. Like us, dogs have things that make them anxious or upset. For Griffey, it's unfamiliar visitors (and the Roomba). For our other dog Grady, it's thunderstorms and fireworks. 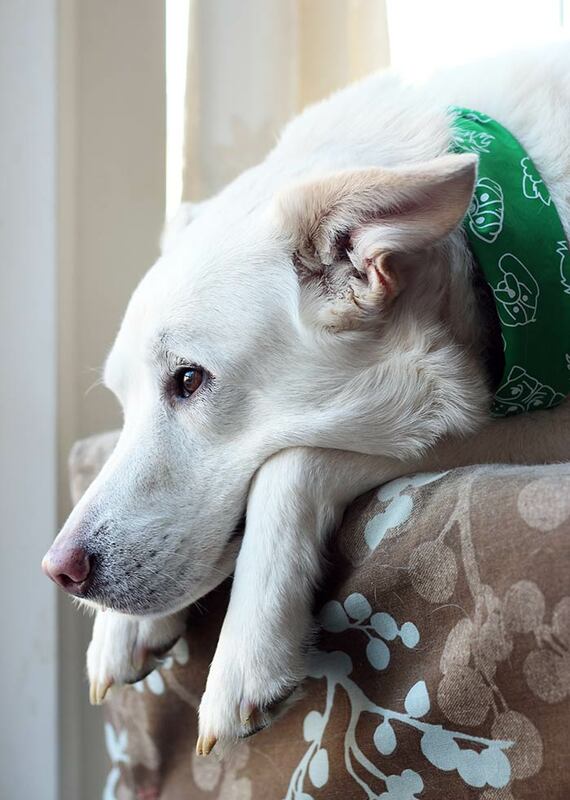 Whatever makes your dog nervous, there are a few things that you can do to make them more comfortable. 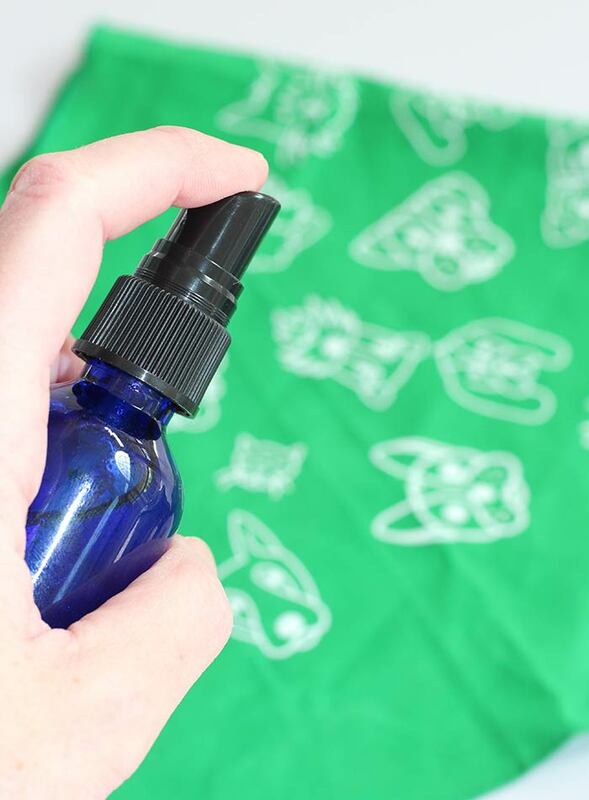 One of my secret weapons is this DIY dog calming spray. 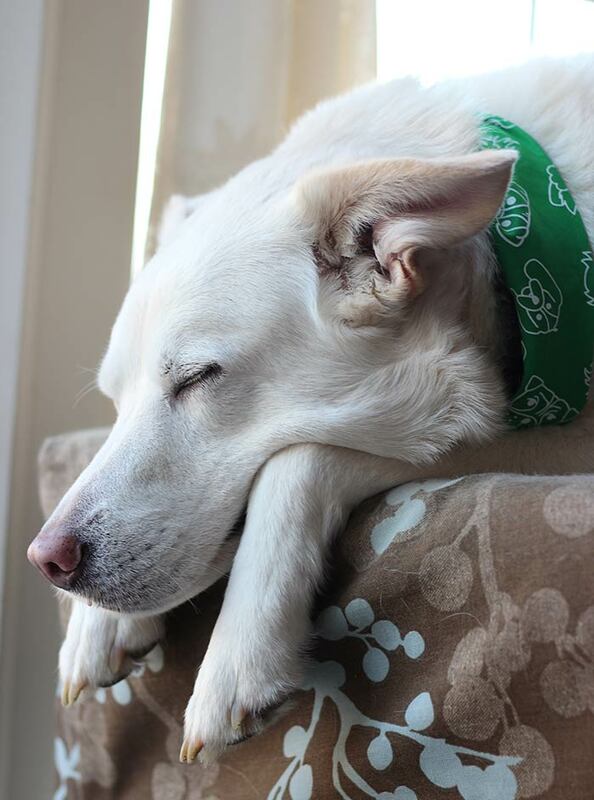 It's an awesome, natural way to help your pups relax - no matter what's causing them stress. We do quite a few things to help our dogs when they are feeling anxious. Grady wears a Thundershirt when the weather is stormy and on July 4. Griffey stays in our bedroom with a favorite treat (usually a stuffed Kong) when we have visitors that he doesn't know well. And recently I've added a dog calming spray that is super easy to make, smells great, and is a wonderful tool to help my dogs relax. See all my tips on how to calm an anxious dog here. 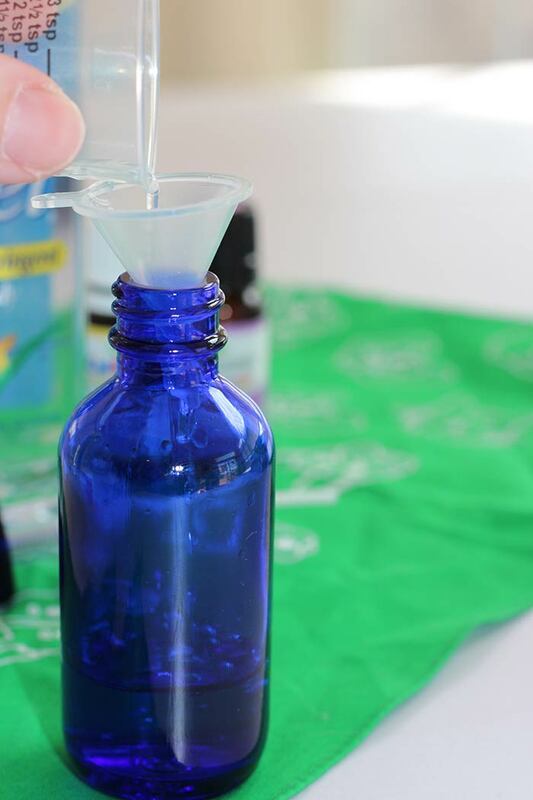 Want to make your own DIY dog calming spray? Here's what you need. Please note I'm not a veterinarian or an aromatherapist. I'm a dog mom sharing what works for our family. Nothing in this post should be taken as medical advice. Please consult your veterinarian or a certified aromatherapist if you have specific concerns about your pet. Using the Calming the Child blend makes this recipe super easy because all the mixing is done for you. And since it's part of Plant Therapy's Kid Safe line, I know that this spray is safe to use in my home around my kids (because it is not unusual to find them snuggling with the dogs in their beds). Keep in mind though that just because oils are kid safe they may not be dog safe. I double check the ingredients of any blend before using it around my dogs. Find a great list of dog safe oils here. You can also use plain Lavender oil if you prefer. Start by adding 1 oz. (6 teaspoons) of witch hazel to a clean 2 oz. glass bottle. I love this set which includes roller bottles and a super handy funnel. I also snagged an old liquid medicine measuring cup to add to my oil accessories - it's much easier to pour than a measuring spoon. 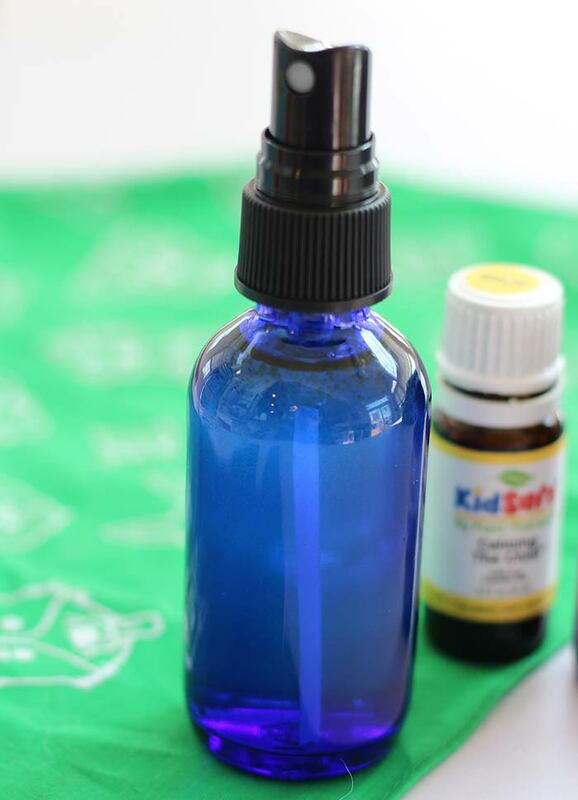 Add 10 drops of Calming the Child (or Lavender) essential oil. 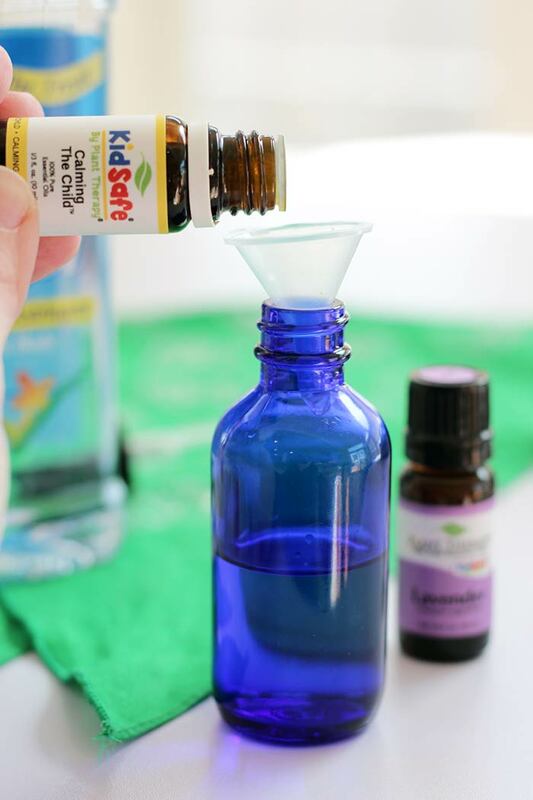 Fill the rest of the bottle with water, close tightly, and shake gently to mix. That's it! Your dog calming spray is ready to use. This spray is not meant to be used ON your dog. It is intended for you to use around your home in the places where your dog will be when he or she needs some relaxation. You can spritz some on your dog's bed or in his crate. Or in the car if he gets nervous on road trips. Any soft spot where your dog might need a little help calming down is perfect! Remember that dogs have a much stronger sense of smell than we do, so I suggest starting slowly with this spray. Use it in an area where your dog can get away if it's too much (so not in a closed crate for example). As he gets used to the calming spray, you can start spraying it on a bandana for him to wear. This is a great way to use it for dogs who get over excited on walks or trips to the vet. I like to spray ours on this bench in our front room which is also known as Griffey's lookout spot. It helps him to not freak out too much when the UPS man arrives, and to even catch a nap while another dog walks by. He loves wearing it on his bandana too! 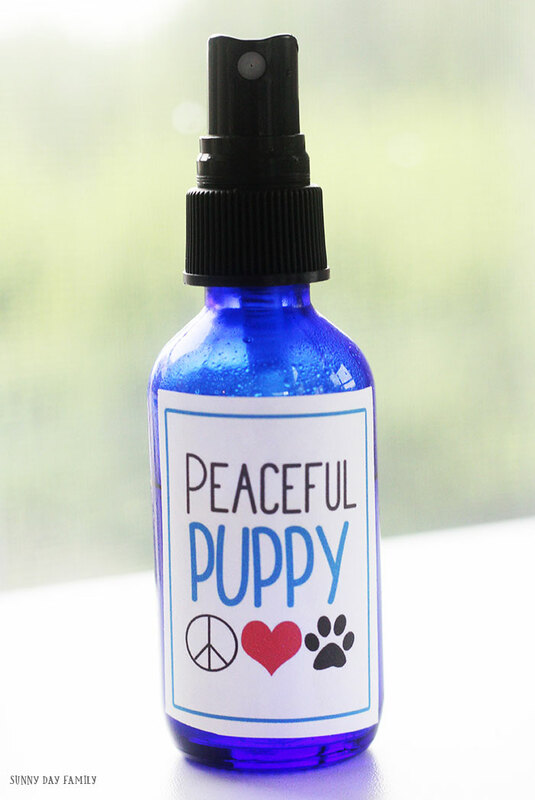 Now you can get free printable labels for your DIY dog calming spray! These labels are made to fit a 2 oz spray bottle. You'll get one sheet of 12 printable labels (perfect to make for gifts!). Simply download by clicking the button below. Then, print on full size label paper, cut out, and adhere to your bottle. Super cute and easy! 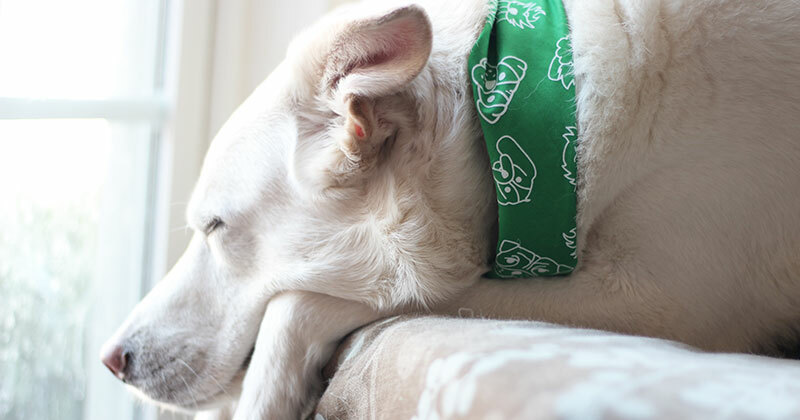 Click here for a super easy way to make a DIY dog bandana. And visit our Pets page for more dog projects and tips.